Winning music effect, performance visual and color guard, ensemble music and percussion captions, Blue Devils scored 85.525 at the DCI Indianapolis Central Division Championships, to become the sole undefeated corps so far this season. Listen to Blue Devils' director Dave Gibbs comment on tonight's win. Interview by Christina Mavroudis-Dempsey. 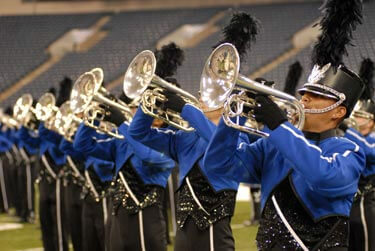 Blue Devils perform in the RCA Dome on Saturday, July 8. The Cavaliers took visual effect, ensemble visual and brass captions to score second with 85.000. The Cadets—along with the Cavaliers—undefeated until this evening, placed third with 83.375. Bluecoats weren't far behind with an 82.350, good enough for fourth. Listen to announcer Dan Potter read the top scores from tonight. Carolina Crown (fifth-79.525) bested Madison Scouts (sixth-78.175) and Glassmen (seventh-77.475), fresh home from a successful trip to Europe. Packed in tight were Crossmen (eigth-74.200), Colts (ninth-74.050) and Blue Stars (10th-72.375). Capital Regiment (11th-70.675), Southwind (12th-68.700), The Magic (13th-64.450) and Pioneer (14th-60.225) rounded out the remaining Division I corps. The big shows the coming weekends include Battle Creek, Mich., next week, San Antonio the following weekend, followed by Atlanta, Allentown, Pa., and then the DCI World Championships in Madison, Wis.